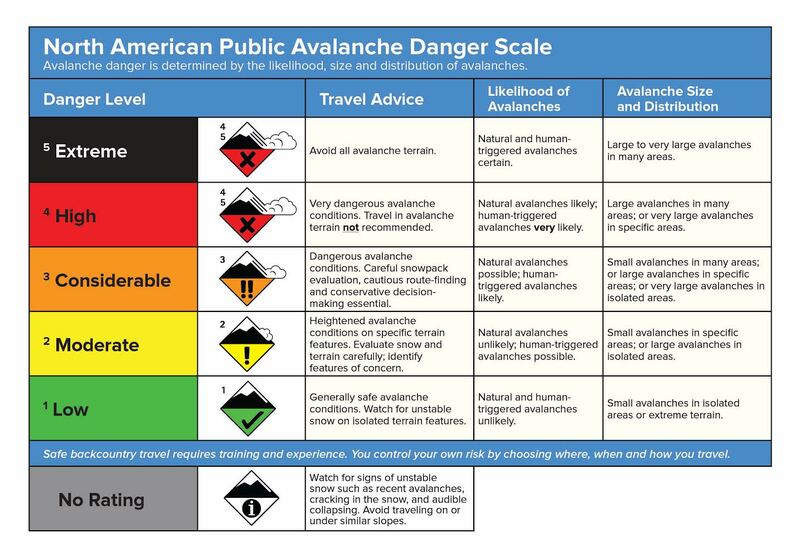 Sunday (3/18) – The avalanche danger has decreased to Moderate for lingering and fresh Wind Slabs on NW-N-NE-E-SE aspects near and above tree line. Loose Wet avalanches will be a concern on solar aspects (SE–S-SW-W), especially near treeline and below where strong heating may take place. There’s a remote possibility that small to mid size avalanches could trigger step down into the deep persistent weaknesses in the mid and lower snowpack. Today’s weather forecast calls for temperatures to warm up today into the upper 20’s and mid 30’s with light winds below 10,000’. The combination will allow the new snow to warm appreciably. As the snow becomes wet and saturated, especially in steep rocky terrain below 10,000’, loose wet avalanches will become increasingly likely on SE-S-SW-W aspects. Upper elevations may see some Loose Wet activity, though more unlikely, in steep sheltered terrain where there is appreciable warming of the surface snow. Lower elevations will warm more quickly than higher elevations. Use extra caution in and around rock outcrops, below cliff bands, or where the snowpack may heat up more quickly and triggered releases are more likely. Watch for signs of unstable snow: large roller balls, deep ski penetration, and small point releases. Small point releases can be a sign that larger avalanches are increasingly possible. Loose Wet can trigger larger deeper releases. Timing is critical for avoiding Loose Wet releases. Time your travels to be out of steep sunny terrain before the snow becomes saturated from the heat of the day. Natural avalanches are possible, triggered releases are likely, especially below 10,000’ in sheltered terrain. The latest storm (3/16) to transit through the eastern Sierra brought a nice shot of snow with 9” to 20” (20cm to 50cm) + of new snow being reported throughout the region on top of the 4” to 20” that we received on Wednesday/Thursday (3/14-15). These two systems were accompanied by moderate to strong Southwesterly winds near and above tree line, which formed Wind Slabs on NW-N-NE-E-SE aspects from near tree line and above. Winds have begun to subside as the system continues to move off to the east. Today’s forecast calls for Northwesterly winds of 10 -15 mph in the upper elevations, with light winds from tree line and below. This will limit snow transport to light localized saltation in the upper elevations and allow recently formed Wind Slabs in the upper and mid elevations to strengthen and bond to the underlying snow and become less tender to triggered release. Lingering Wind Slabs will most likely be encountered on NW-N-NE-E-SE aspects. Dense snow deposits are a telltale sign and will likely be encountered immediately below ridgelines or corniced slopes, in crossloaded gullies, or near terrain features that encourage drifting. Shooting cracks are a strong sign of instability. Hand shear assessments and pole probing can help identify poorly bonded or suspended slabs. Natural avalanches are unlikely, triggered releases are possible. Persistent deep slab weakness persists throughout the region but varies in depth. The variability of depth, overlying snow structure, and distribution makes this problem a challenge for forecasting. Tests continue to show clean and energetic propagation, though becoming progressively more stubborn. The added stress of an inch or more of water weight may be enough to tip the balance and cause this layer to become more sensitive or reactive and increase the likelihood that a: small Wind or Storm Slab avalanche, snowmobile, or a large cornice failure stepping down into this layer and triggering a much larger destructive release. The layer of weak facets can be found ~50 cm (~20”) south of Mammoth to ~150cm (~60”) in the Mammoth/June region, somewhere in between around Virginia Lakes. The deep facet layer is showing slow signs of strengthening and requires a relatively large trigger or a sweet spot in a shallow area of the snowpack to get this deep layer to fail. The problem primarily exists in the mid-elevations on NE-N-NW aspects but may extend into the upper elevations where it may be poorly bridged by Wind Slabs.The lingering persistent weak facets from early season continue to linger but are showing signs of rounding, with some shallow areas becoming wet and refreezing. These are signs that the facets are beginning to strengthen while also becoming more deeply buried in many locations, making it more difficult to trigger. Make your own assessments, especially if traveling outside of the Mammoth/ June area where the snowpack is shallower. Natural avalanches are unlikely, triggered releases from shallow pockets are possible, especially north or south of Mammoth /June where the snowpack is thinner. The latest storm to traverse through the region brought anywhere from 9” to 20”+ (SWE 1” + for many locations) of new snow Thursday/Friday with the greatest amounts of new snow concentrated around the Mammoth/June area, lesser amounts north and south. Moderate to strong W-SW winds in the upper elevations throughout the storm formed Wind Slabs in the mid to upper elevations, primarily on NW-N-NE-E-N-SE-S aspects, which have begun to strengthen and sinter to the underlying snowpack. In sheltered locations from near tree line and below, the new snow is bonding well to the underlying snowpack and shows little signs of Storm Slab characteristics within the new snow. Loose Wet activity is expected to rise on solar aspects, primarily tree line and below, as temperatures begin to rebound today. Loose Dry sluffs may be encountered in isolated steep terrain as the surface snow begins to facet near and below tree line in sheltered locations. While these slides are not a concern for burial, they can sweep a rider into potential hazardous terrain or obstacles. The lingering persistent weak facets from early season continue to linger but are showing signs of rounding, with some shallow areas becoming wet and refreezing. These are signs that the facets are beginning to strengthen while also becoming more deeply buried in many locations, making it more difficult to trigger. Sunday thru Monday - brief shortwave ridging builds over the west today into Monday with increasing high-level clouds and warming temperatures. Tuesday thru Thrusday - An atmospheric river (AR) moisture tap late Tuesday into Wednesday and the second being a colder trough Thursday. Deepest moisture heading into central and southern California, bringing the greatest impacts to Mono County south. How far north the moisture makes it will depend on the timing and location of the upstream trough and how the subtropical jet and polar jet interact. The warmer wetter portion of the storm Wednesday, followed by the colder trough and moisture from that storm Thursday. Initial snow levels Wednesday up to 7500-8500 feet for the southern and eastern Sierra. Snow levels look to fall Thursday as the upper trough moves inland and pushes a cold front through the region. Heavy mountain snow look likely with valley rain late Tuesday through Friday. A period of stronger winds also looks probable Wednesday and especially Thursday. Temperatures: 29 to 35 deg. F. 10 to 15 deg. F. 35 to 41 deg. F.
Weather: Sunny then becoming partly cloudy. Mostly cloudy. Partly cloudy. Temperatures: 22 to 27 deg. F. 7 to 12 deg. F. 28 to 33 deg. F.